The Aston Hotel is located in a charming curved street not far from the Opera district of central Paris in an elegant building dating from Baron Haussmann’s remodelling of the French capital in the mid-19th century. Enjoy breakfast in the stone vaulted dining room and linger to admire the outstanding marble floor in the reception area. The Aston Hotel offers a pleasant, cosy base right in the heart of the City of Light. Well-located in the heart of Paris, near the Garnier Opera, restaurants and shops. Excellent value for money. The 36 cosy rooms offer a tasteful, modern decor in a mix of light and cheerful colours. In the ensuite bathrooms, tiles in a warm chestnut shade offset white floors, basins and bath/shower units. The rooms are equipped with all modern comforts: Air conditioning / heating, balcony, free Wi-Fi Internet access, flat-screen TV with satellite and cable channels, radio, telephone, safe, tea/coffee facilities, ensuite bathroom with shower, bath and hairdryer, wake-up service and ironing facilities. All rooms are non-smoking. From the Hôtel Aston you can discover a cross-section of Parisian life. 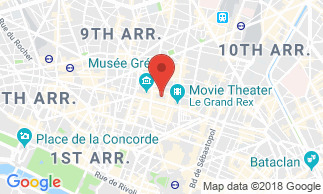 The hotel is situated just off the Grands Boulevards, the wide avenues conceived by Baron Haussmann when he famously redesigned Paris for Napoleon III. You can stroll to the beautiful Opera Garnier or the famous Galeries Lafayette and Printemps department stores. You will be close to the renowned Folies Bergères, and a short walk takes you to the Sacré Coeur with its splendid view of Paris, or to the Louvre Museum with its world famous exhibitions. A buffet breakfast is served each morning in the hotel's breakfast room with an arched stone ceiling. It is served from 7 am to 10 am. Breakfast can also be served in guests' rooms upon request (without extra charge). It is not included in the room rate: 15 EUR per person.